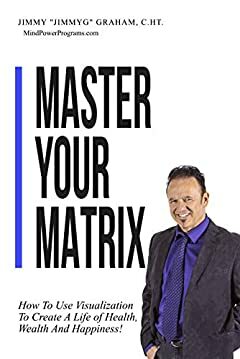 Master Your Matrix: How to Visualize Your Way to Health, Wealth, and Happiness! Are you living life to it's full potential? You can continue to "hope" things will change OR you can make the decision now to Master Your Matrix! MindPower coach, Jimmy "JimmyG" Graham, C.Ht. will show you how to use the power of visualization to improve your health, increase your wealth, and boost your happiness. This is NOT just another Law of Attraction "woo-woo" book. You'll learn the actual science of how your mind works to create your reality. in chapter one, you'll learn how thinking about one simple word can change your entire world. In chapter four, you'll discover a mind power technique that can turn the impossible into "anything's possible." In chapter six, you'll discover which celebrities use these visualization tools to create superstardom. And in chapter ten, you'll learn how four master mind pillars can turn your goals into reality. At the end of each chapter, you'll get a simple action plan that will train you to get focused, stay motivated and produce the results you want to achieve.